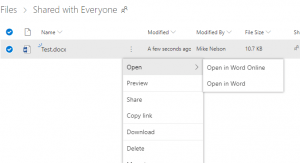 Home > Tips & tricks > Should you use OneDrive online or offline? SP library ? Microsoft OneDrive or SharePoint document libraries can be used online or offline and we believe it should be a conscious choice. There is a good argument to use OneDrive online for users that don’t travel. Unless you are a mobile user, having the OneDrive client downloading and syncing data is an unnecessary complication and use of space and resource. It also removes a level of understanding of the cloud based product for new users of Office 365. 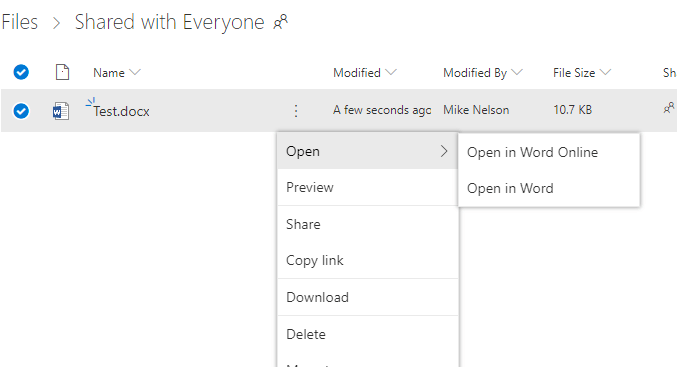 Using OneDrive online does not necessarily mean the Web version of Office. This makes returning to documents easier from within the application. You may also consider using the “pin document” facility for regularly used files. Arguably, in a busy office environment where lots of people edit documents in the same library constantly, even using documents at the same time (multi-user Excel for instance) the use of the “off-line” synchronised version of OneDrive will perhaps introduce unreliability and version confusion. In addition to these basic options, there is now OneDrive “Files on Demand” – see the Microsoft article here. With correct use, this goes some way to managing the space used by OneDrive and being able to flag files as online only where appropriate. Again, this is perhaps a complication too far and simply using the web browser to Open files with no OneDrive client at all is the simplest and therefore the most reliable option.